Once your order is shipped we will send you an email informing you that your order from Drapery Curtain Rods has been shipped out to your address. Please verify your order confirmation immediately upon receipt to verify the details of your order. 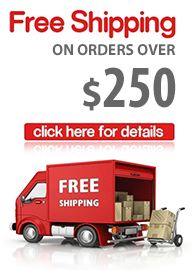 Orders can be cancelled within 6 hours of order placement without a cancellation fee. After 6 hours and before delivery, a 20% cancellation fee will be charged. Please call us at 1-800-680-2905 if you wish to cancel your order. If our shipping providers are unable to deliver your order due to an incorrect address, the order will be returned to us and you will be responsible for the shipping cost incurred. You will also be responsible for any reshipping fees charged by the shipping company to redeliver the package. In the case where the order is undeliverable due to our mistake you will not be responsible for the shipping cost incurred, we will cover these costs.